In accordance with Volume 5, § 255 of the Guide to Judiciary Policy, the District Court for the Northern District of Illinois will provide reasonable accommodations to persons who are deaf, hearing impaired or have communications disabilities. These accommodations include sign language interpreters or other auxiliary aids and services to participants in federal court proceedings including parties in the case, attorneys, witnesses, and jurors who are deemed legally qualified to serve by the Court. Individuals seeking assistance should contact the court’s Access Coordinator as soon as possible in advance of the scheduled court proceeding, or upon notification, so that appropriate accommodations can be arranged. Requests should include the case number (if applicable), judge before whom the proceeding is to take place (if applicable), time/date of proceeding, and description of requested accommodation. Additional accommodations and services may be provided upon the approval of the presiding judge. A handicap accessible loading zone is available near the Dirksen Courthouse. The zone is located on Plymouth Court, just south of Jackson on the west side of Plymouth Court. 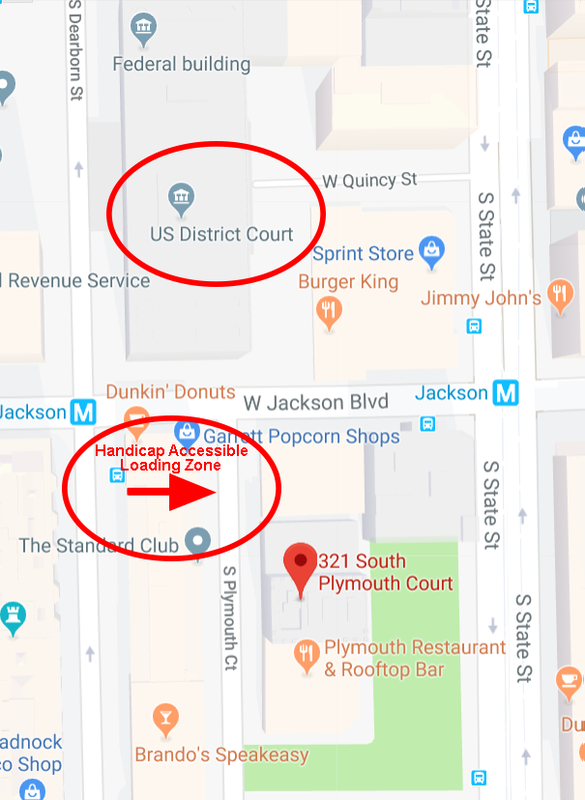 Additionally, there are limited number of handicap parking places on Plymouth Court, just south of Jackson on the west side of Plymouth Court.